Mick and Nadya got married at The Bridge, with the beautifully striking navy and choral colour scheme! Their wedding cake was a dark blue velvet cake with two tiers, filled and covered with cream cheese icing and decorated with choral, blue and white silk flowers (the flowers and the bunting was supplied by Nadya). 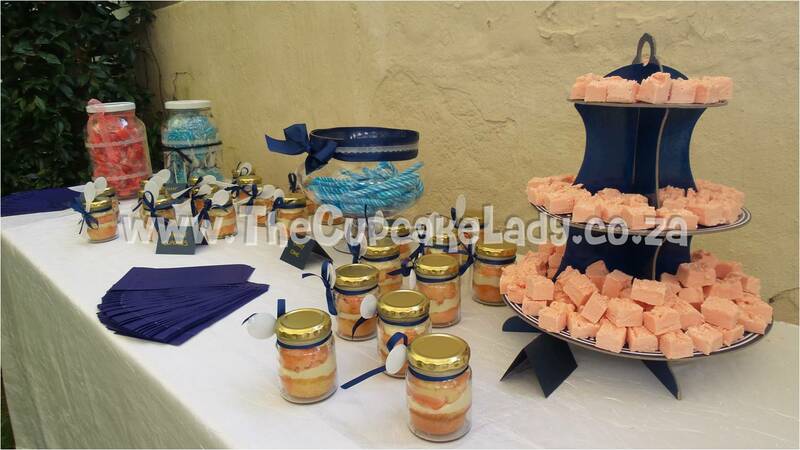 They also had a sweet table for their guests, and included strawberry flavoured “fudge” (this is my non-traditional fudge, made with white chocolate) and choral velvet and vanilla marble cupcakes-in-jars with navy ribbons.